A high and lonely, desolate mountain of volcanic rock, highest summit of the Bedded Range. The peak is located south of the Coquihalla River's headwaters and can be viewed to good advantage from Needle Peak. Best access is from the Tulameen area. Some of the ridges on Coquihalla allegedly offer interesting class 3-4 scrambles. The area around Coquihalla is frequented by snowmobilers in the winter months. The summit itself has 3 peaks lying in an east-west line. The highest is the west peak, at 2157m. The east peak is 2121m. 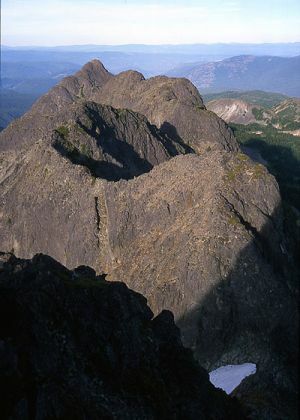 The three peaks can be traversed, with the most difficult being between the center and west peak - a knife edged ridge, exposed class 3 with steep drop on both sides. Geology: The volcanism which created Coquihalla occurred in the early part of the Tertiary era, during a period when the "line of fire" resulting from subduction was further inland than it is today. Peaks like Garibaldi will probably look something like what Coquihalla does now, in another few million years. Similar old, eroded volcanoes may be found dotted down the east side of the Cascades.